I dunno for sure, but I reckon you can never have too many pictures of roofs – although maybe we should consider starting a new blog, dedicated to roofs? We are working on one which will be just nature and wildlife – perhaps roofs should be our next big online project after that? 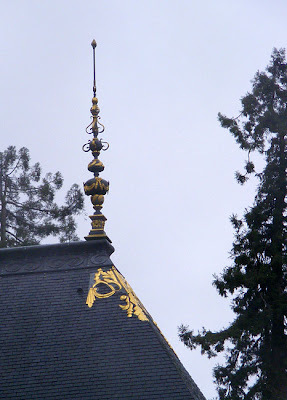 In fact, we take so many pictures of roofs that I am not even certain where this one is – Montrésor I think. 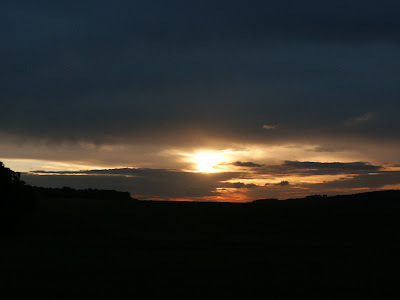 Two sunsets, taken a few days apart at 8.00 pm in early summer near Preuilly sur Claise. 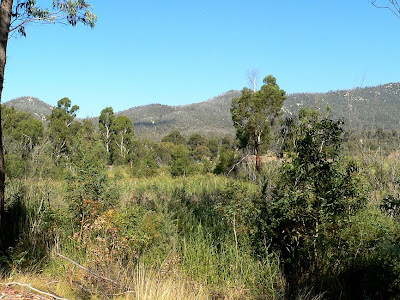 My sister lives near some excellent places for bushwalking, and when I stay with her we go out walking most days, sometimes surveying for birds. 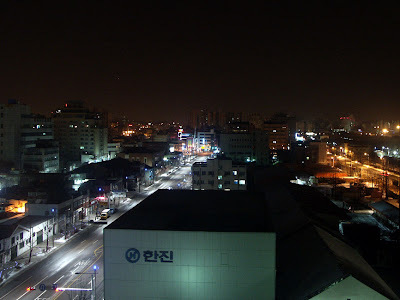 Here are some photos of the things we encountered. The biggest fly I have ever seen! 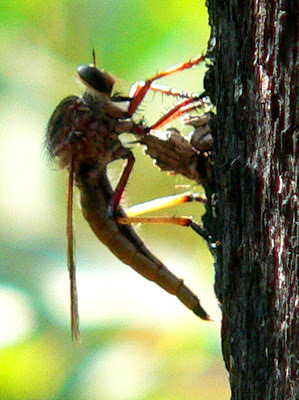 A female Robberfly (Asilidae) laying her eggs under the bark of a gum tree. This place, a nature reserve which is used for a number of strands of scientific research, was completely burnt out 6 years ago. Only a tiny handful of the resident wildlife survived. If you click on the picture to enlarge it you can see that there is a sort of grey haze over the trees on the hills. These dead branches are the still visible aftermath of the fire. 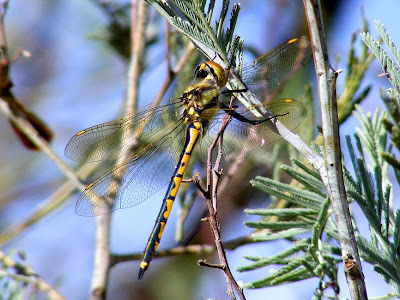 A Tau Emerald dragonfly Hemicordulia tau, female, resting in a Wattle Acacia sp. My sister, surveying for birds. Like many birdwatchers, my family contributes to the national Atlas scheme to record the distributions and status of bird species. 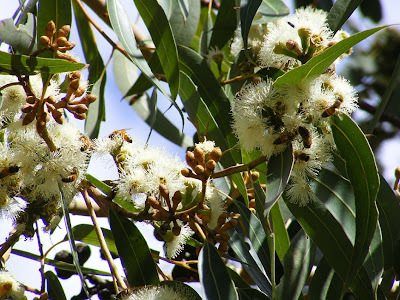 A flowering gum tree Eucalyptus sp, full of European Honey Bees Apis mellifera. 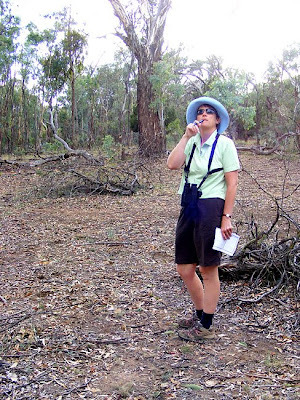 Smooth Drooping Mistletoe Amyema miquelii, growing in a gum tree Eucalyptus sp. Most Australian mistletoes have evolved to have leaves that look very much like their hosts. 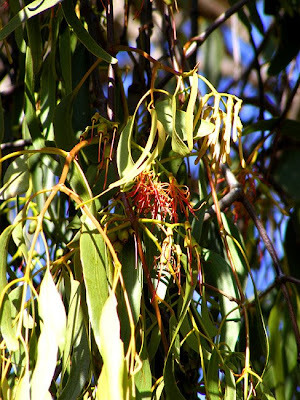 They are spread by a tiny bird called the Mistletoe Bird, and the flowers provide nectar for honeyeaters. Some species of butterfly caterpillars eat only a single species of mistletoe. 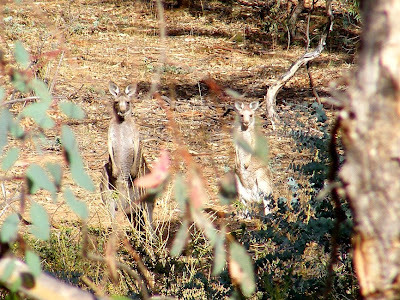 A pair of Eastern Grey Kangaroos Macropus giganteus. They are so numerous here that contraceptives are being used to lower the birth rate and control widespread overgrazing and starvation. 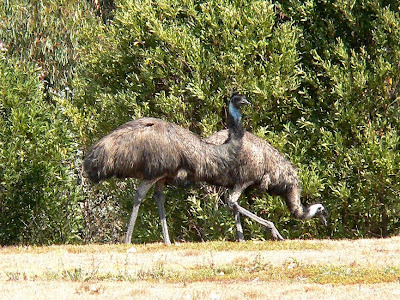 A pair of Emus Dromaius novaehollandiae. 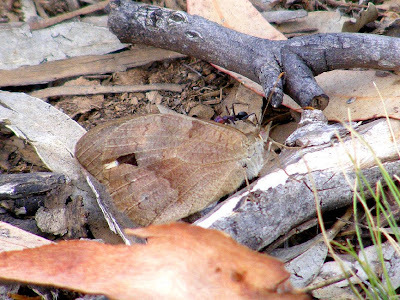 A female Common Brown butterfly Heteronympha merope merope, totally camouflaged in the leaf litter. A pavlova is a large disk of meringue, crispy on the outside and marshmallowy on the inside. It is absolutely nothing like the dry, chalky meringue shells that one can buy in the supermarket. Dolloped on top is whipped cream, and the whole is decorated with fruit. Strawberries are very traditional, but raspberries, banana, mango and kiwi fruit*, and various combinations of these, are probably just as popular. The one fruit which is more or less essential on top of a pav is passionfruit. 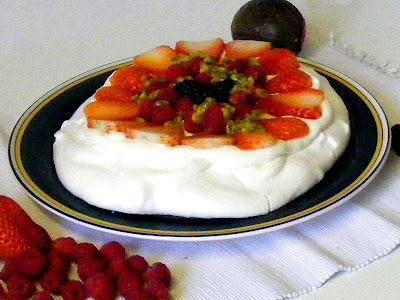 A pavlova is one of the few dishes that combines pieces of fruit (as opposed to purée) and cream in a way that enhances the fruit rather than masks it. Perhaps the influence of the sweet crunchy/spongey meringue is the secret. The meringue base before it goes into the oven. It is important that a pavlova is cooked in such a way that the meringue barely colours. The merest hint of off-whiteness is acceptable but anything more is shameful failure. The meringue base after it has come out of the oven. Rinse out the bowl the egg whites are to be whipped in with boiling water. Add a couple of drops of lemon juice and wipe the bowl completely dry with kitchen paper towel. This ensures no residual fat or moisture in the bowl to spoil the loft of the egg whites; it warms the bowl, which aids the aeration of the egg whites; it adds a touch of acid, which will strengthen the protein of the egg white, enabling it to hold air longer. Beat the egg whites slowly for about 30 seconds until frothy. If you are worried about the stability of your egg whites, you can add cream of tartar at a rate of ¼ tsp per egg white at this stage. Cream of tartar is an acid in powder form. A little acid will help the egg white, as noted above, and because it is in a powder form, you are not adding moisture. 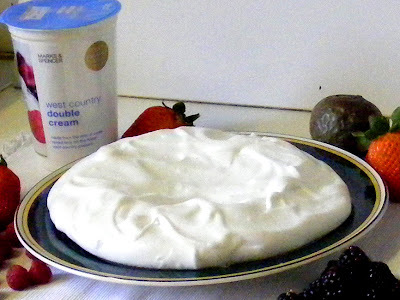 Meringue is so sensitive to moisture that it can even fail on particularly humid days. Now beat the egg whites rapidly for a minute or two until they are stiff and pull up into peaks that don't collapse when you remove the whisk. It is much easier to overbeat than underbeat egg white, so take care. Overbeaten egg whites will start to produce liquid and separate into little clumps, losing glossiness. Add the sugar a heaped tablespoon at a time, whisking for a few seconds to incorporate each addition. 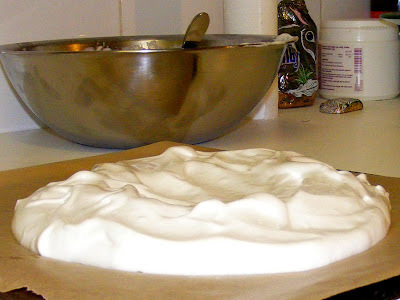 Spoon the meringue onto the prepared baking sheet and shape gently into a roughly 20 cm circle. Push a little from the centre out to the sides so they are slightly raised and the centre slightly sunken. Don't fuss too much with it, as the more you prod and push the more air you squeeze out of it, no matter how light your touch. Put it on the top shelf in the oven and turn the thermostat down to 70°C. Cook for 1 hour, then turn the oven off. Leave the meringue in the cooling oven for a minimum of 4 hours, and preferably overnight. To finish, transfer the pavlova base to a flat plate. Spread the whipped cream thickly on top and decorate with the fruit. Cut into wedges and serve. This size pavlova will serve 6. *Please note: it is kiwi fruit. Kiwis (on their own, without the fruit) are either a family of flightless birds endemic to New Zealand, and one of that country's national symbols (link to the cult video cartoon Kiwi! on YouTube); or the generic nickname by which people born and bred in New Zealand are known. 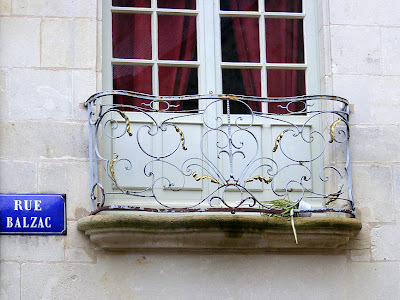 This rather nice wrought iron balcony in the street leading up to the château in Azay-le-Rideau caught my eye. Salamanders and ermine are heraldic emblems you will often encounter in the Loire. Salamanders have a similar symbolic meaning to the phoenix, that is to say, they emerge miraculously unscathed from the fire. It is believed that salamanders acquired this reputation because people would observe them scurrying from fireplaces. The truth is the poor creatures had probably been sheltering in the cool damp conditions of the log pile and only emerged when forced to by the flames. François I made the salamander motif his own by displaying it frequently and prominently, but in fact, it was already an established Valois family emblem. 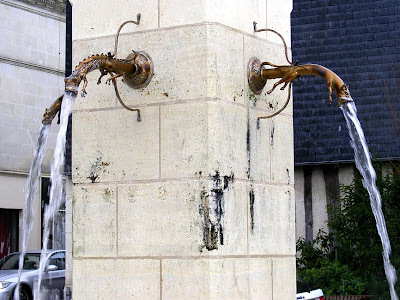 here depicted on a fountain in Azay-le-Rideau. His queen, poor Claude, who was eclipsed all her life by more glamorous women at court, is today remembered not so much because of the many sleek and sinuous ermine her husband had carved to keep his salamanders company. Instead, she is the inspiration for the name of a popular and delicious type of plum, known as a Reine Claude in France, or greengage in Britain. Ermine, by the way, is a stoat in its winter coat, which because of its white colour, came to symbolise purity. 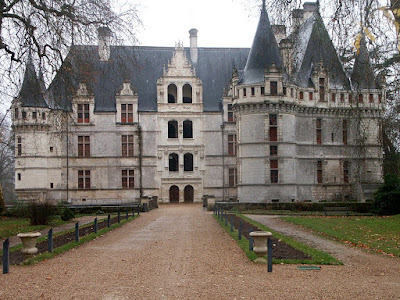 The château of Azay-le-Rideau is one of the earliest of the Italianate style Renaissance châteaux of the Loire. 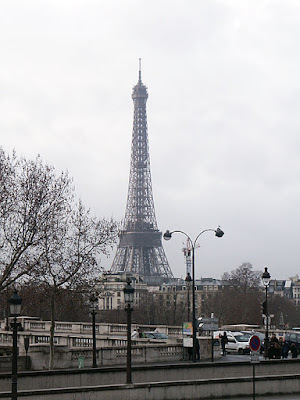 Even on a wet winter's day, when the museum staff are on strike and the château is closed, it's worth stopping by. You can stand in front of the gate and look through at the beautiful central staircase and the fairytale exterior. 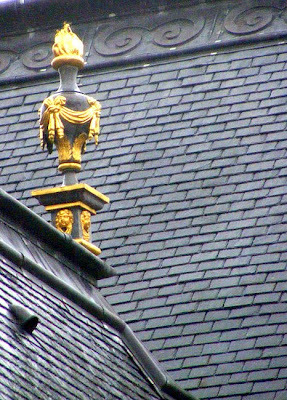 It's been a while since we had any roof photos, and I found myself quite unable to resist such a lavishly appointed example. 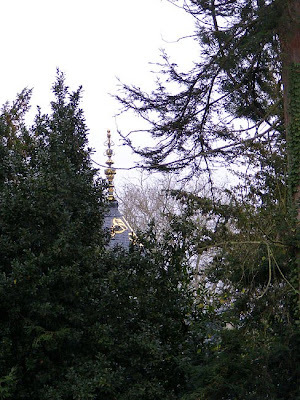 A first glimpse through the yews and giant conifers. The decorative treatment of the roof is just gorgeous - I'm a real sucker for this combination of subtle geometric repeat patterning adorned with rich and detailed surface decoration. 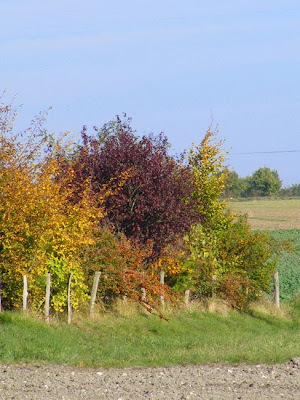 We hadn't used it before, but I thought as we had a summer photo yesterday, it was time for an autumn photo today. To celebrate the start of winter, a photo from summer. 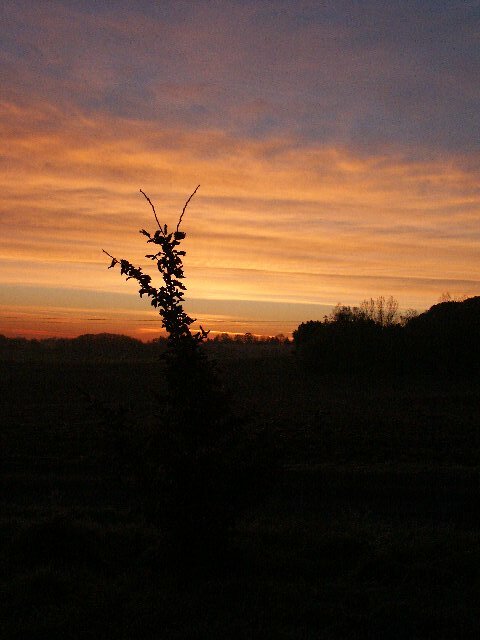 It's the shortest day of the year today: from here on in the days get longer, and in 5 days time the sun even starts coming up a little earlier every day. 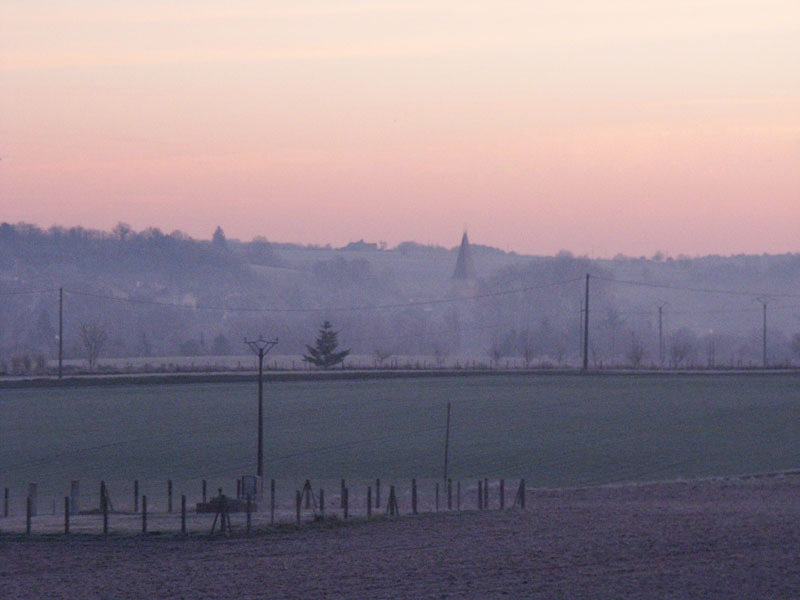 We were really surprised the first time we came to the area for Christmas - it was possible to get up, have breakfast, pop outside and take a few photos of sunrise, and pop back inside for coffee. All before 8.30. 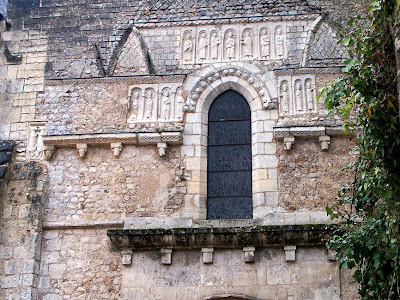 The town of Azay-le-Rideau has more to offer than just one of the Big 6 Châteaux, but you would never know by reading the Michelin Guide to the Loire Châteaux. 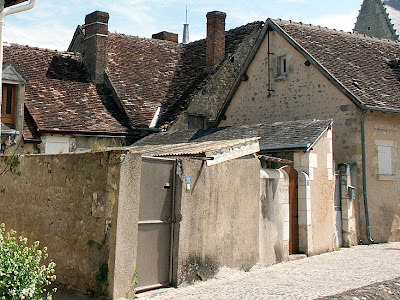 It's true that the château of Azay-le-Rideau is particularly beautiful, but even a short walk through the centre of the town will provide other architectural gems that I am surprised the Michelin Guide did not feel were worth mentioning. 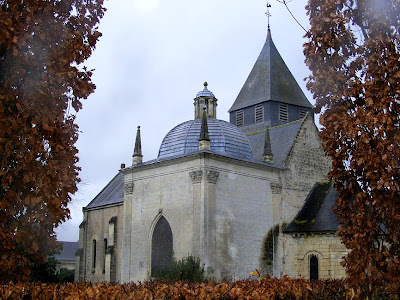 The church of Saint Symphorien is very close to the château, and if you park in the town's public car park, you have to walk around it to get the château entrance. The oldest part of the church is 9th century, and it is mostly Romanesque from the 10th to 12th centuries, with additions in the 16th and 17th centuries. There is a good article about the church here. We didn't get to go inside because there was a funeral in progress the day we visited. 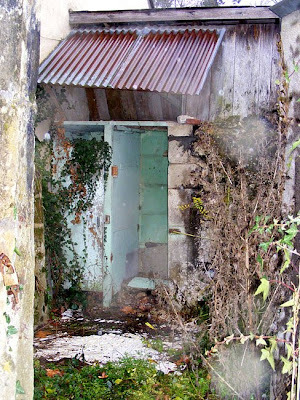 Dunnies out the back of the church. I'm not sure whether these long drops are actually on church or château property, but the yard opens on to the street in a way that leads me to think they were once in use as public facilities. They are quite similar to the ones at the back of our graineterie, although these are painted a rather more upmarket looking arsenic green. An old building like ours contains many mysteries. 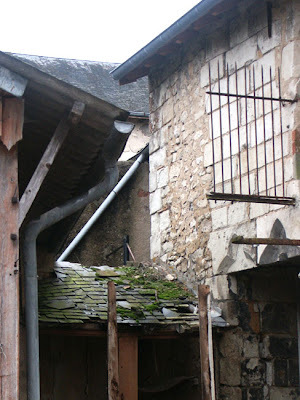 The back of graineterie displays several features that make one curious as to why they appear as they do and how they relate to the past and each other. Having had work done at the back of the house has meant that we've had the opportunity to stand around pondering these mysteries and theorising. 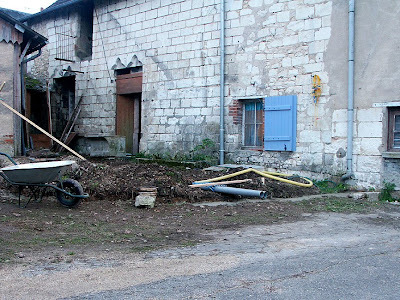 Mystery #1: is the rubble section where a wall set at right angles to the graineterie once stood? If so it was substantial, being as thick as the existing graineterie walls and running the full height. It is quite likely that the party wall with the neighbour's courtyard, the dunnies and the stable block (garage) are all later constructions, but I am still puzzled by why the rubble wall does not appear to have run quite in line with the end of the graineterie, but was set back slightly – which seems to be what the neat cut stone corner indicates. Mystery #2: these openings appear to be original. There has been some discussion as to whether the carved stones were made for this building or are ancient salvage. Expert and learned opinion leans toward them having always been in this position, but there is still something odd about them. At the moment they present as a window and a doorway, but why are they at the back of the building? They are grander than the simple pointed arch that is the only original opening in the front. Why are they hidden away around the back? Was the orientation of the building once north, not south? And there's another thing – the carved stones are the lintels of the openings, but they are joined in the middle, not a single piece of stone. After much beard stroking and discussion with architecturally interested friends (special credit to John here), we've come to the conclusion that both openings once had mullions ie a vertical carved stone support up the middle of the opening, and that they were both windows. 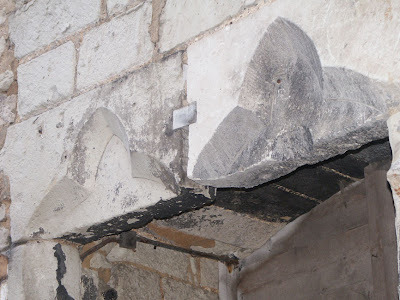 At some stage, someone has come along and blythly removed the support for the carved lintels. The only reason they have stayed up is because the real weight of the wall is actually supported by immensely thick round arches behind. This theory does, however, leave us with another mystery to solve. Why are the openings not placed symmetrically, and why was there no door on this side of the building? Thus we come to Mystery #4: what if there was once a door where the small window is now, with matching carved lintel arrangement? What if this doorway was altered in the same cavalier fashion as the windows, but because it was perhaps a bigger opening or in some other way different, removing some of the supporting stones caused a collapse? (Credit here to Simon for this theory.) Perhaps the wall did not actually fall down, but sagged alarmingly and was jacked up again as best they could. This might explain the intact corner and end wall as well as the oddly irregular, but not rubble, appearance of the wall above the window. Intriguingly, the left side of the window surround includes three stones with carved corners which exactly match the surrounds of the other two openings. Did these stones survive the collapse and remain in situ? 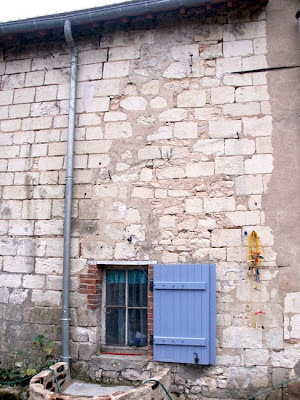 Was the wall now too dangerous to rebuild the door, so a smaller compromise opening was constructed out of anything to hand, and one of the original windows became the new doorway? And for those of you wondering about Mystery #3: I've got no idea why the string course does not continue, but there is no evidence that it has been hacked off or removed. 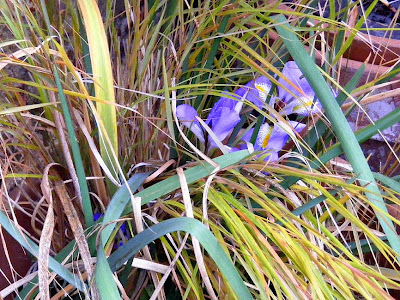 Winter Iris / Iris unguicularis / Iris d'Alger is a reliable way of brightening up the garden in winter. 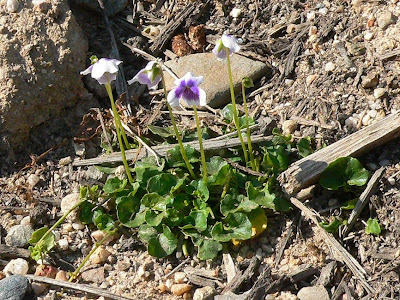 Mine started flowering in early December and with luck will continue through to February. One of the reasons I walk the orchard every few days is because I am always on the lookout for new native colonists, now the area is not subjected to periodic bursts of Roundup, and I think slightly less frequent mowing. I have been particularly hoping some of the native orchid species will establish themselves. Orchids are very sensitive to herbicides and disturbance, so I was curious as to how long it would take them to appear. 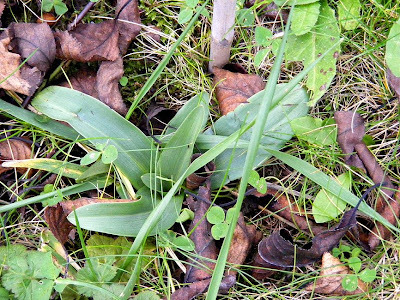 I was fairly sure Lizard Orchid / Himantoglossum hircinum / Orchis Bouc would be the first to arrive, and I am delighted to announce that on 20 November 2009 I discovered 6 rosettes of emerging Lizard Orchid leaves, most of them growing near the cherry trees. 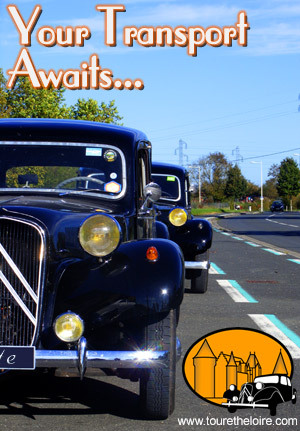 No one who lives in Preuilly-sur-Claise will be very surprised by this news. 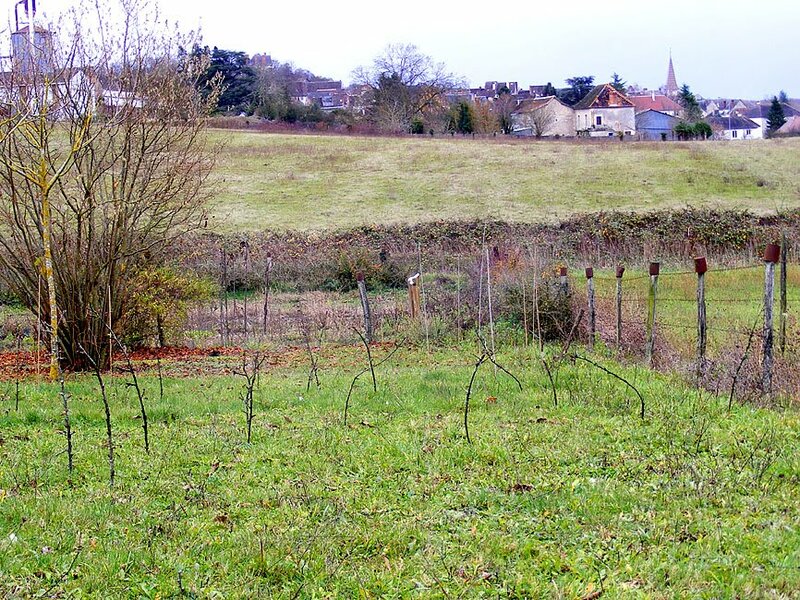 Lizard Orchids may be rare in the UK, but they are almost considered a lawn weed in Preuilly, which for some reason is a Lizard Orchid hotspot, even for the Touraine, where this species is common. 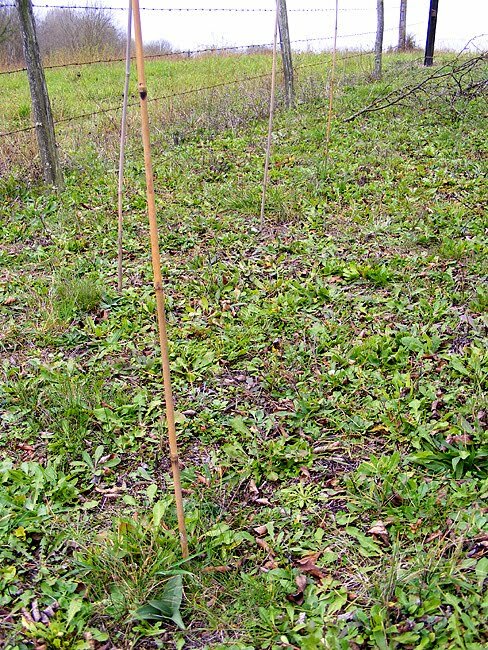 I have staked the young plants so they will not get accidentally trodden on or mowed off. Alex, who mows our orchard three times a year, may find the canes rather a nuisance, but it can't be helped. The Lizard Orchids will grow to about 45cm high and flower in early summer. After that they will set seed and disappear, so they can be safely mowed over in autumn. The neighbouring farmer was out spraying the fields to the west and north of the orchard, and the day was quite breezy, but fortunately the wind was coming from the south-east, so we escaped the drift. 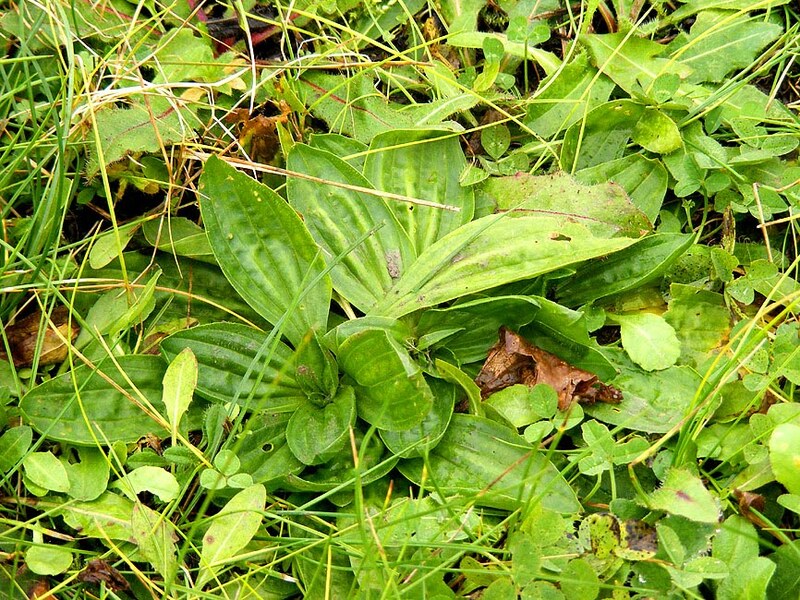 A rosette of plantain leaves, not orchids. Can you tell which is orchid and which is plantain? A few days later, I realised that these half dozen rosettes were only the tip of the iceberg. At last count we have over 60 Lizard Orchids emerging in the orchard. The main colony is near the Walnut trees. The prevailing wind here seems to be from the east or south-east, and I think this is significant. 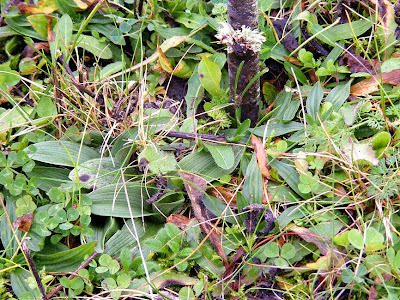 Orchid seed is microscopic, and windborne, and this would be the first area of the orchard such seed would encounter. 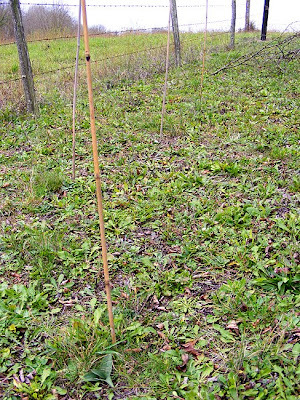 A forest of canes and cherry twigs marking orchid plants. They are not easy to spot in the melange of plants that overwinter as rosettes in rough short grass. The only way to do it is to walk the entire orchard with your eyes fixed on the ground about a metre in front of your feet. Several times I stepped back from marking a plant with a cane to find that I had been standing on one of its brothers. I believe this is some sort of hint. It is someone's special day today and it's a biggie. As we have so many orchids in the verger, that person won't need any orchids from the shop, will they. 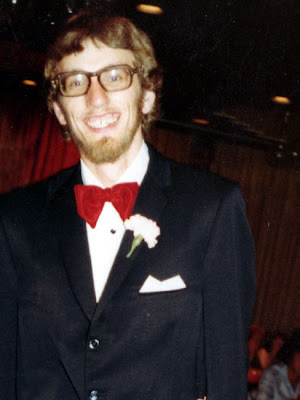 Today it is 30 years since I graduated from College. There are photos of the graduation ball, but there is probably no-one in there you would recognise. Tomorrow, when you have all stopped laughing, we will resume normal service. 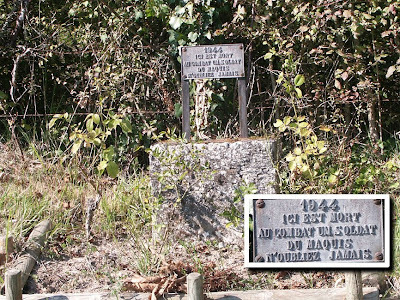 The memorial is on a little travelled road out of Chaumussay. I have marked in on a map here. Every time we travel around the area we discover a memorial which is new to us. I remember my mother preparing beef tongue when I was a child, simmering for hours, then skinning and pressing, before it was cut into neat slices for salads or sandwiches. I remember liking both taste and texture. 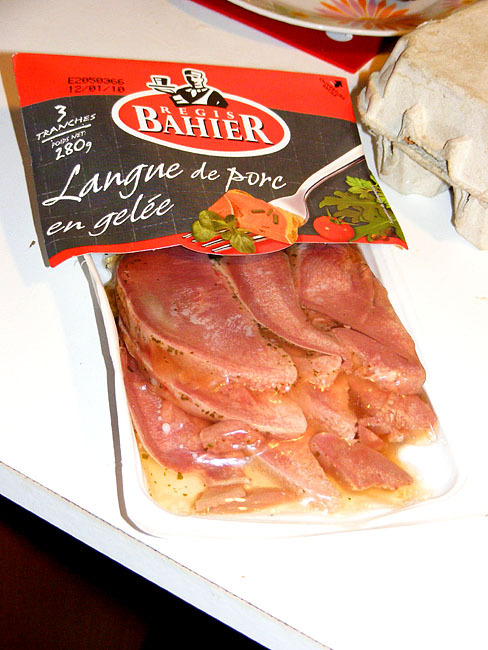 Fresh beef tongue is widely available in France and not all that expensive per kilo. I fancied buying a tongue to provide a bit of a change on the lunchtime platter. But beef tongues are enormous - 4 or 5 kilos of solid meat. You can buy half tongues, but they still put a serious hole in the weekly food budget, coming in at about 10€. In the end I decided we would go for something smaller (and even cheaper per kilo if you buy it and cook yourself). Pork tongues are just as widely available, and lamb tongues are sometimes too. I bought a packet of cooked pork tongue in aspic, to see if we liked it. So far as I can tell, comparing the pork tongue to my far away memories of beef tongue, they are very similar, and I will definitely be buying the occasional fresh pig's tongue to slow cook myself. 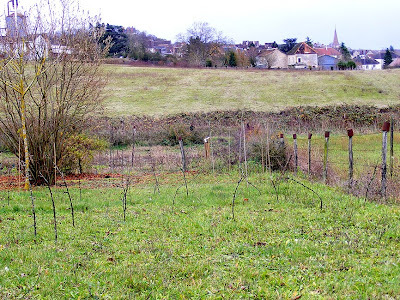 One day in late November our orchard neighbour was selling Pieds de Moutons at the market. These are an edible fungus known as Hedgehog Mushrooms in English. These were not grown commercially, but harvested wild in conifer forests. 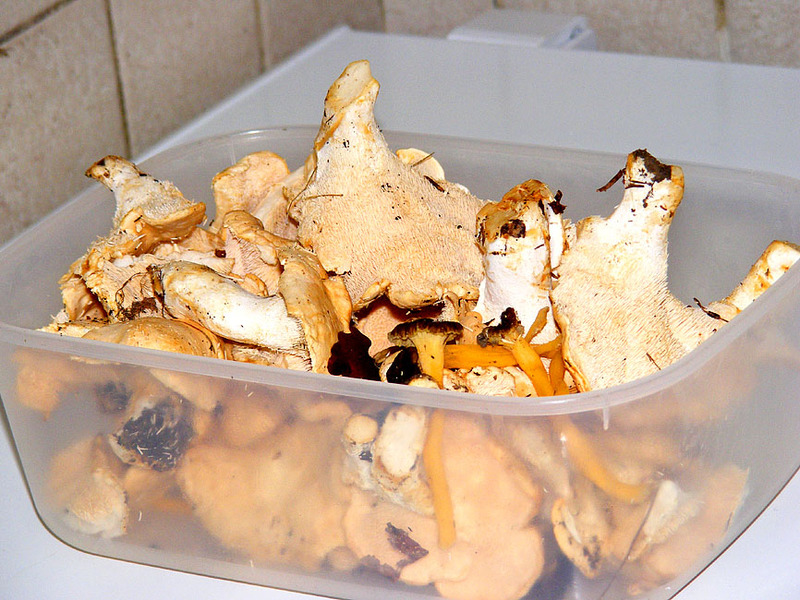 A box of hedgehog mushrooms. I had never seen this type of mushroom before, but I recognised it immediately because I've seen pictures in fungi fieldguides. 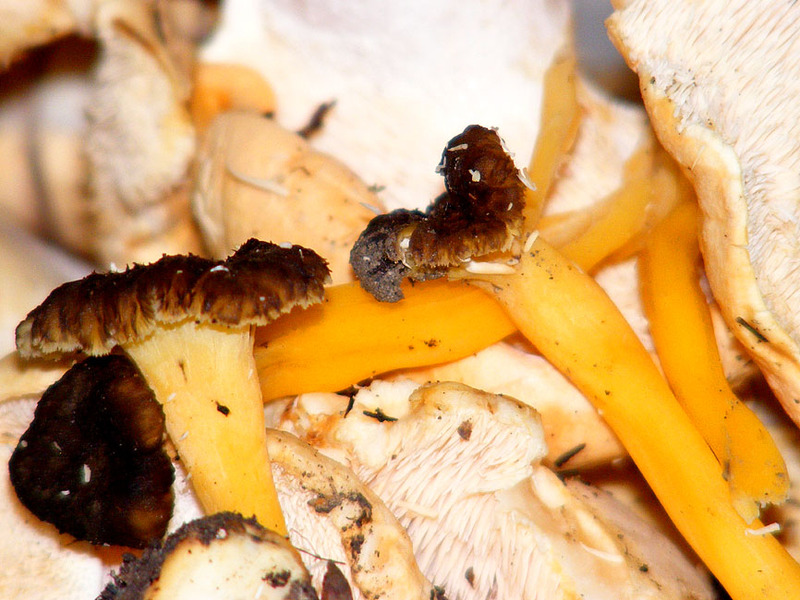 It is one of the few truly unmistakeable edible wild mushrooms, that can be identified simply by looking at the pictures in a fieldguide. The French name translates literally as 'sheep feet', but I think pieds in this case is being used to mean 'small plant' and the English equivalent is probably something like 'vegetable sheep', and their pale undulating shape reminded someone long ago of wool fleece. 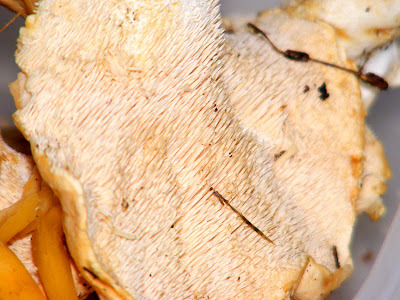 The teeth on the underside. Their scientific name is Hydnum repandum. Their most distinctive feature are the pretty pale salmon pink 'teeth' on their underside. Our orchard neighbour told me I must scrape off the 'teeth' and trim the bottoms of the stems before cooking. This was very easily achieved by turning them upsidedown and gently running a small knife over them, after which an orange stain appeared. There were a few rather aged Girolles (aka Chanterelles) in the box too. They released an enormous amount of 'juice' once in the frying pan, and I cooked 500g of mushrooms very hard for 10 minutes to reduce the quantity of liquid to about a tablespoon. We ate them immediately in an omelette and they were pleasantly mushroomy, with good firm flesh. 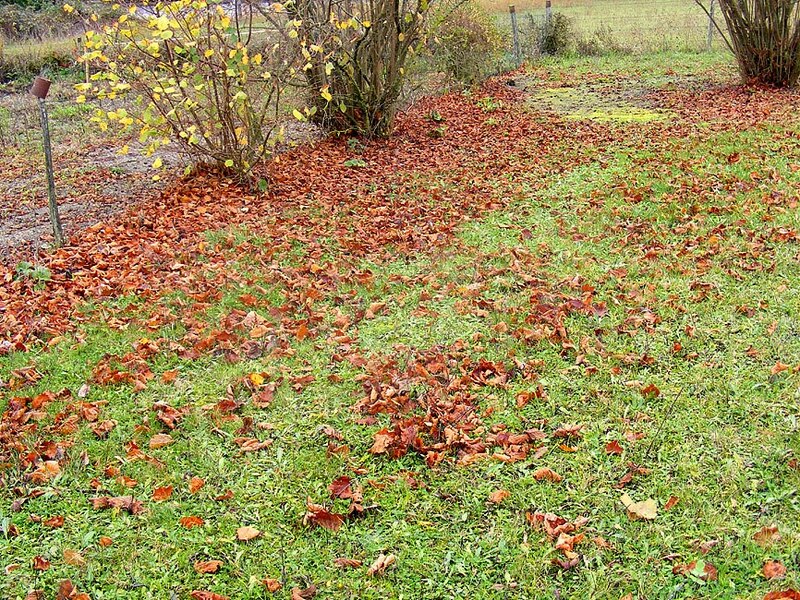 Do you see the area of grass that is not completely covered in dead hazel leaves, that runs from bottom left of the photo to the lime green patch of moss top right? That's a small mammal trail, made by a hedgehog or a squirrel running from the pile of prunings out of the picture to the left, up to the hazel tree on the right. This one is quite wide and made by a big enough animal that you can see that the grass is slightly depressed by the mainly nocturnal traffic. If the light and weather conditions are right, you can stand in the spot this photograph was taken and see a series of tiny trails through the grass. The smaller ones are made by voles, shrews and mice, crossing the orchard on their nightly quest for food. Winter is football time. As in the UK there is a snobbery about the various football codes: the round ball game is working class, and people of class will only reluctantly acknowledge they follow it, whereas rugby is seen as a lot more stylish. Every village has its own foot (soccer) team. 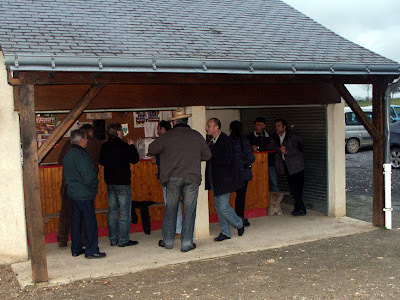 At one time Preuilly sur Claise had 3 teams in different leagues, now it is reduced to one team in combination with Yzeures sur Creuse. 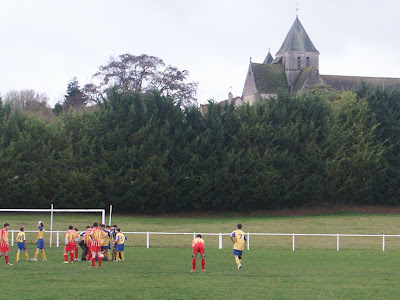 Every village with a team has its own ground, and a lot of these are floodlit - in our immediate area both Bossay and Preuilly have floodlit pitches. They should be a focus for village pride, but alas they are sparsely frequented, and most of the action seems to take place around the bar. If you're in the area and looking for a cheap drink on a Saturday afternoon, look for a football pitch. You will be helping the funds of a local organisation, and you might even see some football. We inherited a small patch of Jerusalem artichokes in the potager, and have been digging a few once or twice a week since mid-October. They are delicious roasted, or in a cream sauce, but they do have an unfortunate side-effect. 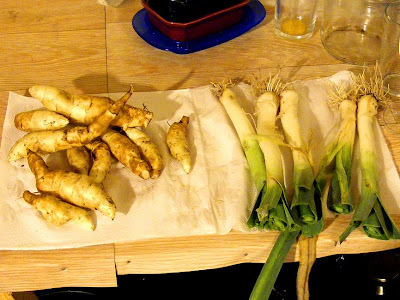 In vulgar households (like ours) they are referred to as fartichokes, but I have just learnt that in some nice households they are known as sunchokes. In French they are topinambours (sometimes shortened to topinam). The name sunchoke makes good sense, as they are not related to artichokes, and don't come from the Middle East, but are related to sunflowers (in fact, they are the same genus, Helianthus). The plants look a lot like small sunflowers above ground, with similar leaves and flowers. Below ground though, once the leaves and flowers have gone brown, they set about making starchy white, slightly knobbly, mildly nutty flavoured tubers which go well with all the other earthy winter veg. I never peel them, just scrub well. the same time and made into a creamy soup. Some people around here grow substantial quantities of fartichokes – long rows that must yield enough to feed a large family. They seem to be very easy to grow – apparently you just leave a few tubers in the ground each winter and they grow on to provide next year's crop. People who were reading back in September 2007 may remember when we found our well. It was sitting under a large, ugly concrete slab at the back of the house, but in my mind I already had plans for it - one day we would have a classic Tourangelle well. 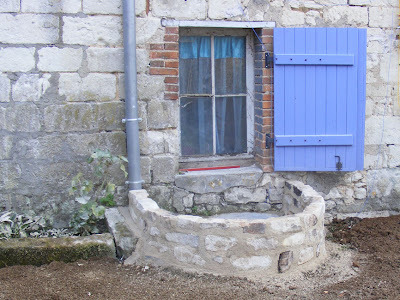 Unfortunately, its position directly in front of a window precluded anything too fancy, but as part of the garden works we had Alex build a well wall around it. 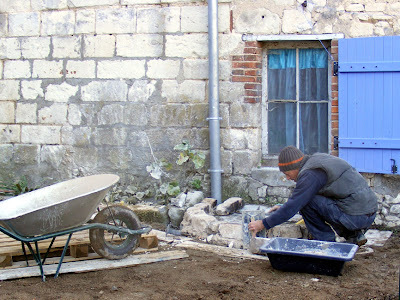 He used traditional materials: the tuffeau (limestone) came from the old chimney which was demolished in 2007, and the mortar is chaux, the traditional lime mortar. The plan is to fill this with flowerpots, and put in a submersible pump so we can water the garden even when there are water restrictions. 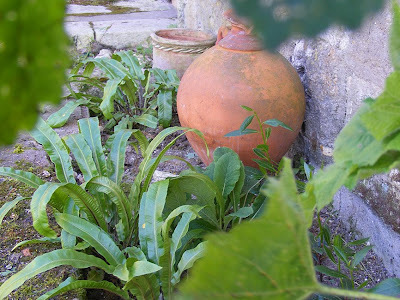 We had water restrictions this year, which weren't widely publicised but prohibited the use of town water for watering gardens. 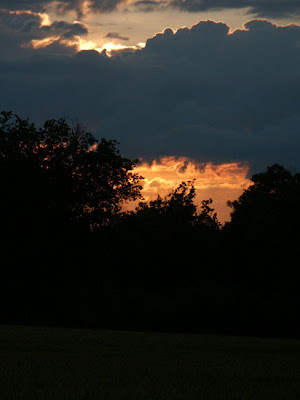 We are entering a really busy time of year and may not always be able to write an entry every day, but much like what happened in May, we will continue to post something new every day.